The nights are getting longer, the leaves are beginning to fall – and Christmas is just 35 days away! If your holiday shopping is already in full swing, let us just say one thing: this is not the year for socks. This is not the year for gift vouchers, or for cash hastily stuffed inside a Christmas card and thrust at the ‘lucky’ recipient on the big day. This is the year where you get it right – every time – with gifts for the entire family. Whether its Mum, Dad or that distant auntie that you only see once a year, we’ve put together this gift guide with the entire family in mind. With stunning accessories, sparkling jewellery and tonnes of personalisation options, there’s no excuse not to Step outside of the proverbial Christmas box, and buy them something that they will truly cherish this year. 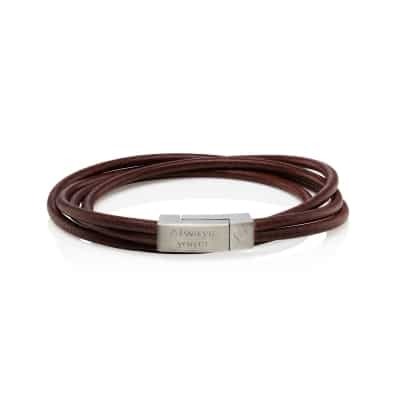 This stylish, soft leather bracelet is the perfect gift for a wonderful husband. Even if he’s not one for wearing accessories, he’s sure to love the simple but stylish design – the plaited leather is casual while the silver clasp can be personalised with a secret, heartfelt message on the underside. 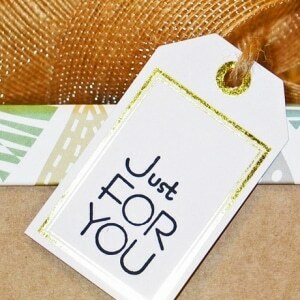 A stylish and thoughtful gift. Nothing conveys love quite like the heart symbol. This beautiful necklace features a stunning polished heart of either rose gold, silver or yellow gold, perfect for showing your wife how much you care this Christmas. The pendant itself is large at 30×29 mm, making it a great piece of statement jewellery. Plus, the gorgeous pendant features the word ‘love’ engraved at the bottom, and can be personalised further with a short message on the back, making this an ideal gift that fuses style with sentiment. Mum will love this sparkling nugget bracelet this Christmas, which is available in either a stunning silver or gorgeous gold finish. One of our best-loved bracelets it features geometric nuggets plated in precious metals that really catch the light, and is finished off with a stylish tag that can be engraved with a short message. 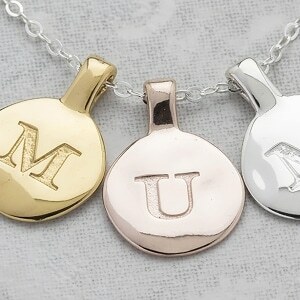 Plus, if you’re not sure about mum’s wrist size, don’t fret – as the bracelet is adjustable from 17-19cm. Engraved messages of love and affection aren’t everyone’s cup of tea. If your dad falls into this category, then our morse code bead bracelet is the perfect gifting option. Send a secret message with this stylish and contemporary bracelet, created using Miyuki beads and sterling silver beads to spell out your message in morse code. Plus, the bracelet arrives in a luxury gift box with a decoder card, so Dad can read your secret words. Surprise Nan this Christmas with a beautiful personalised candle. Hand-poured in the UK, this gorgeous rose candle has an elegant floral fragrance and comes in a subtly decorated jar. 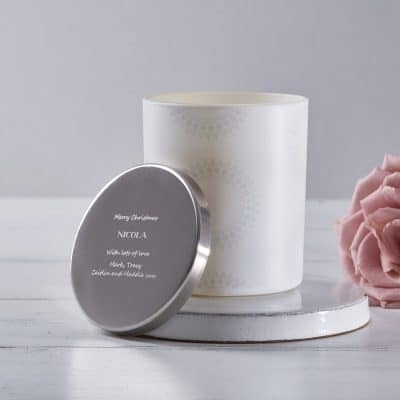 The highly polished lid of the candle can be engraved with your own message, which can be as long or as short as you wish, as the text will be scaled accordingly. Grandad will love this split ring keyring, which features a 20mm silver charm that captures your lovely photos, encasing them in high grade resin for a clear but durable finish. A fantastic gift option for people who are difficult to buy for, this keyring is functional as well as sentimental- so it’s sure to be a gift that Grandad will treasure. 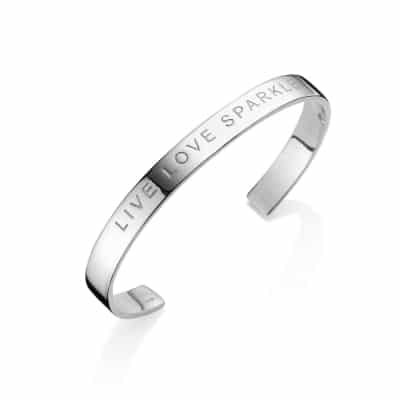 The bold words of encouragement on this bangle make it the perfect gift for daughters everywhere, reminding with the empowering mantra to live, love and sparkle! The message is engraved in capitals in a classic font, and the sterling silver bangle is flexible, with rounded edges so it glides on and off the wrist with ease. A stylish, contemporary piece that is great for everyday wear, and sure to be a winner this Christmas. The rustic leather of this bracelet combined with the brushed steel magnetic clasp gives it a distinctly masculine feel – perfect for sons or grandsons who like simple but chic accessories. 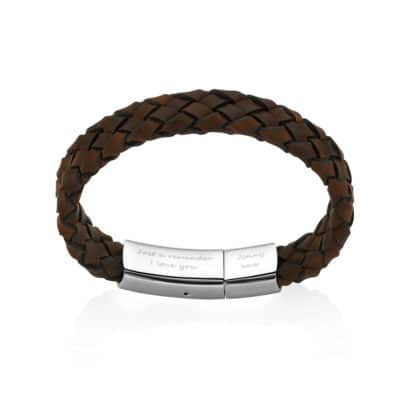 The bracelet wraps twice with two strands of soft, antique brown leather and the magnetic clasp can be personalised with your engraved words to make this gift extra special. 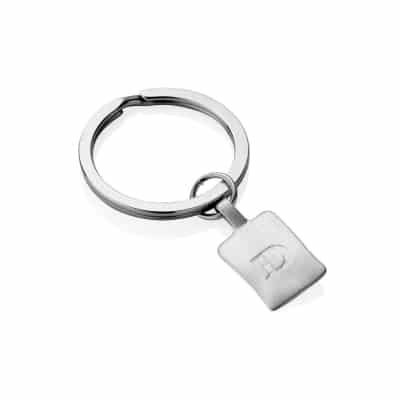 A simple but uniquely personal gift that’s stylish as well as functional, this keyring can be engraved with any letter of the alphabet. You can choose one charm, or personalise it further with multiple charms to spell out a word (such as ‘uncle’) – the perfect gift for Christmas, or any other occasion. One of our personal favourites, these silver or gold nugget hoop earrings are perfect for gifting, and are great for refreshing any jewellery collection. 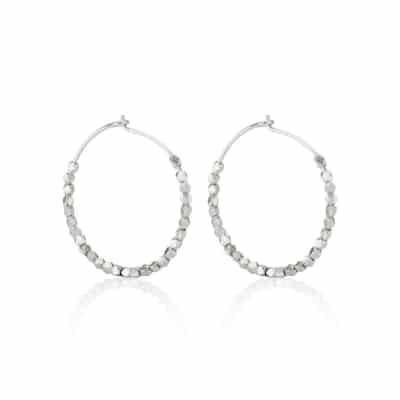 Small, organic nuggets of silver or gold make up the hoops, cut at irregular angles for a natural look that sparkles when they catch the light. Make someone’s day with this beautiful and thoughtful gift.